The Johnston County Tourism Authority operates using Rules for Small Boards and the following by-laws. 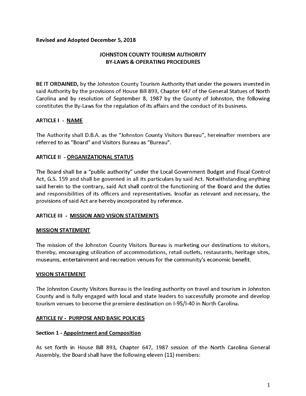 The Johnston County Tourism Authority By-laws determine the operating procedures for the way the organization runs, and are based on the enabling legislation that originally created the Tourism Authority in 1987. Current adopted version is dated December 5, 2018 and is available here to download.